While visiting the main, touristy sights of Valletta and Mdina during my week-long stay, I also took the time to check out the smaller towns and villages. Many of these visits were scattered throughout the various days I was there, so I will be consolidating them in this post. Might be somewhat miscellaneous (and a bit all over the place), but it’s a way to fill in the details of what happened in-between visiting all the other places in Malta. “Eye” guard tower in Cospicua. Following an intensive morning sightseeing in Valletta, I took the ferry to the Three Cities in the afternoon. Just across the Grand Harbour, the *literally* three cities of Vittoriosa (aka Birgu), Senglea, and Cospicua are less touristy, but still offer beautiful churches, piazzas, and a stunning marina. As each of them are tiny, it’s easy to walk over from one to the other, which was what I did that afternoon. While the Maltese skies had managed to stave off the rain in Valletta that morning, it was sadly not the case during my visit to the Three Cities. Humidity, as well as the scent of rain, hung heavily in the air as the ferry docked in Cospicua’s port– thankfully, the rain hadn’t started when I crossed the bridge to visit St. Julian’s Church inside the fortified walls of Senglea. Unfortunately, the church was closed for the early part of the afternoon, and it wouldn’t reopen until past 16:00. I continued exploring Senglea, heading to the very tip of the peninsula where I visited the Gardjola Gardens. 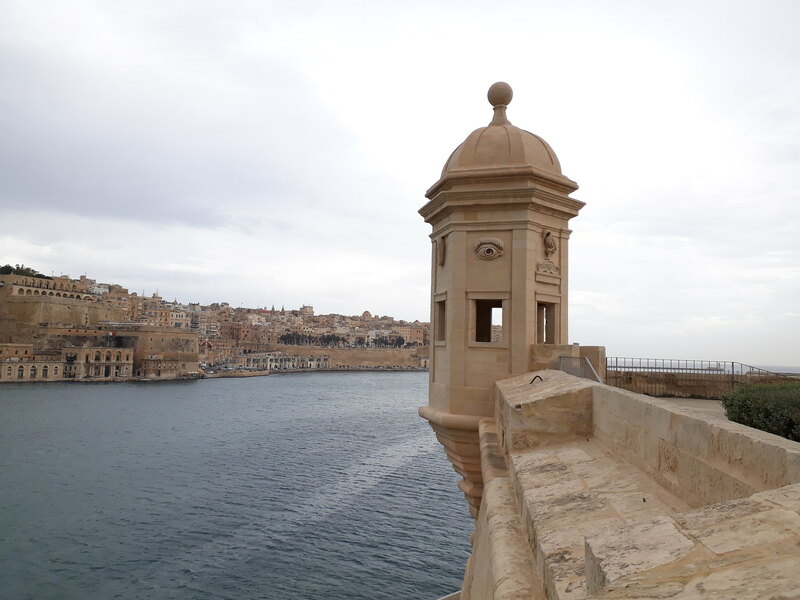 Situated on top of the fortified walls, the small garden contains a distinctive guard tower, with an eye carving that’s to represent its history of watching over the Grand Harbour. Not only that, but I also got great views of the harbor from the other side. The rain kicked in as I headed to Vittoriosa/Birgu. What began as a sprinkle quickly turned to a notable downpour– thankfully, I’d brought my umbrella to use. All the time, it wasn’t the most pleasant of visits I’d experienced, especially when I was hoping for warm sunshine all-week long. Guess that’s the drawback to visiting in the winter! I reached Vittoriosa/Birgu, where I got lovely views of the marina from the fortified walls. It was absolutely mind-boggling to see so many different ships– yachts, rowboats, motorboats– docked all over the port. If I’d thought that car parking had been a nightmare in cities like Los Angeles or Paris, then this was the water equivalent to it! The rain was still in full-effect as I headed into Vittoriosa/Birgu. Upon reaching the small pjazetta San Filippu, I decided to call it a day and take the ferry back to my hostel. Ferries back to Valletta operated every 30 to 45 minutes, which meant I had to wait a bit for the next one to come– I hung out under a flimsy awning at the dock point, along with other tourists who also desired respite from the less-than-stellar weather. Surprisingly, it did not rain in Valletta when we returned– in fact, there was just a hint of sun over the horizon! It was interesting to observe just how weather could change so drastically in such short distances of the island-nation. In any case, it made my ride back to Sliema less stressful, and I concluded my first full day in Malta. The Three Cities were, overall, more tranquil and less touristy than Valletta. I didn’t find there was much to do in each city, and I suppose the dreary weather somewhat put me off from enjoying the visit. All the same, should the weather be ideal, the Three Cities are worth stopping over for a few hours from Valletta. 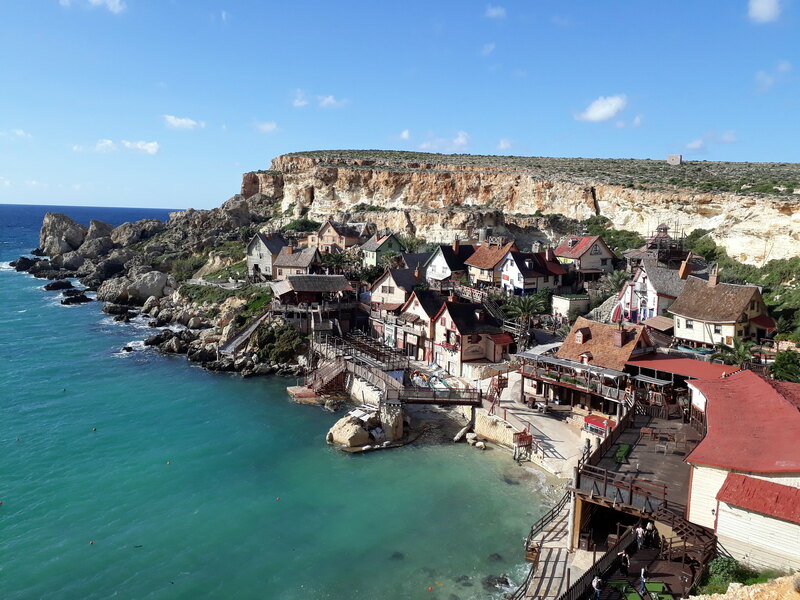 Located northwest of Malta in the town of Mellieħa, Popeye Village is a tourist draw for those who are a fan of the one-eyed, spinach-loving cartoon sailor. The “village” is actually the former filming set for the 1980 Popeye musical film, which starred the late Robin Williams. Today, it has been converted into a theme park, which I suppose is good for kids and their parents to check out while visiting Malta. After a half-day trip to the neighboring island of Comino, I decided to stop by Popeye Village, since is was a short bus ride over from the Cirkewwa Ferry. I hadn’t intended on visiting the theme park, but in the end, I decided to go for it. The admission fee was hefty at over 10 euros (9 euros discounted), which I didn’t find worth it in the end. Popeye Village had a kitschy charm to it– being that it was a movie set for the beloved American cartoon, the bungalows and props were a bright, multi-color pastel– strangely enough, I found the site resembling that of the bungalows in the Caribbeans. I went bungalow to bungalow, where there were artifacts left over from movie production and souvenirs to be purchased. The admission fee came along with a free postcard and a free drink, both of which I got, but aside from that, I saw the entire theme park within 30 minutes. I found Popeye Village to be a let-down, since there really wasn’t much to see or do there. I also shouldn’t have paid the overpriced fee to enter, and instead I should’ve just walked across to the vantage point for a *free* postcard view of the “village”– I admit, the site from afar is quite pretty, as it could easily be mistaken for some actual, picturesque village. Should you really want to visit, skip the theme park and just take a photo from the vantage point. This small, fishing village (pronounced “mar-six-lot,” as I was taught) is located at the south end of Malta. Even though it only has a population of about 3300, it’s a notable destination for tourists, as its vibrant, colorful port should not be missed. 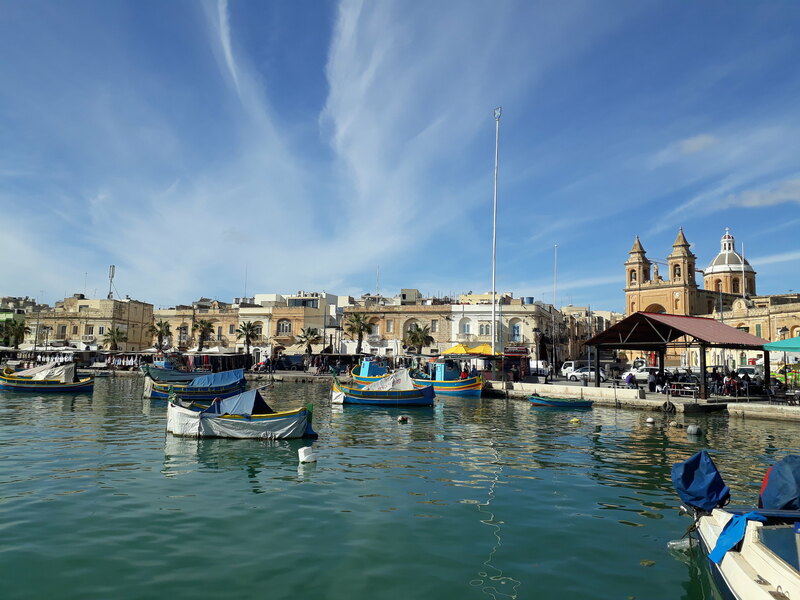 At first, I didn’t plan to visit Marsaxlokk, for it was a bit far from the rest of my week-long itinerary. However, I ended up having some extra time, so I decided to squeeze in a visit to the fishing village. I took a 55-minute bus ride from Valletta, arriving in the mid-morning. Weather was perfect that day, with blazing sun and deep-blue, cloudless skies. I’ll say that there isn’t much to Marsaxlokk, except for the fact that it’s pretty. 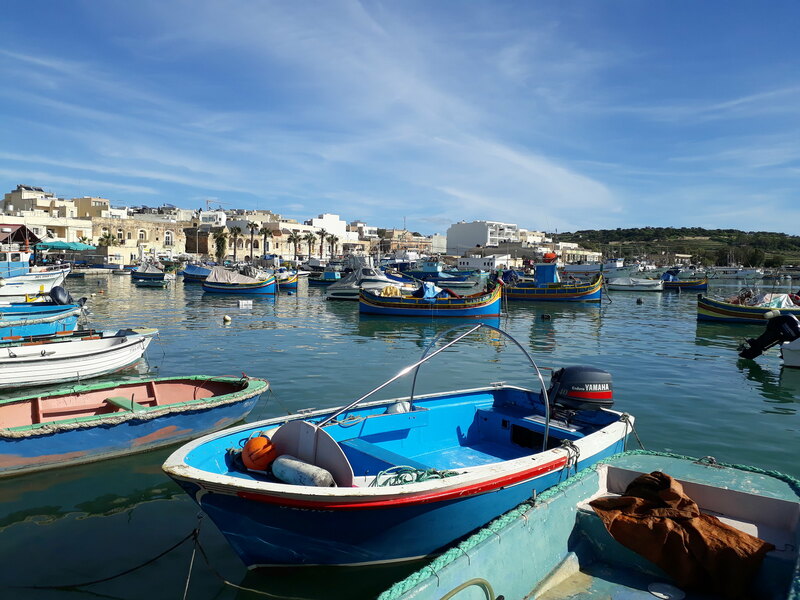 Sure, one could stroll along the harbor dotted with traditional luzzi (a type of Maltese boat) and perhaps enjoy a delicious plate of *expensive* seafood at the various restaurants on the quay– but that’s pretty much it. I spent no more than two hours ambling back and forth along the quay, taking plenty of gorgeous photos to show to my family and friends. After getting a pastizz as a light lunch, I left the village, catching the next bus back to Valletta. These three destinations I visited were, by no means, the highlights of my time in Malta. Although they ended up being a hit-or-miss, I don’t regret checking them out. I especially liked Marsaxlokk, as it was one of the prettiest places in the island-nation. It’s a matter of sometimes seeing the smaller attractions in a country, particularly if you have the time for it. I’ll be recapping the last of my adventures in Malta in the next post! Very interesting! It’s true a lot of architecture has inspired/been inspired by other cultures in the world. That is fascinating! I’d like to read a post about that. Appreciate the information! Great post, I loved Popeye’s village the most. It’s picture perfect. Thanks! Popeye Village is pretty, at least from the outside!